When you’re relaxing on a massage table, it’s easy to see massage as a gift. Whether you’re there to reduce pain, to ease anxiety, to help you recover from the physical and mental stresses work/athletic training/parenting/simply being alive, massage is a moment of freedom in an occasionally crushing world. If you’re thinking of sharing the gift of massage with someone else for a special occasion or “just because,” you are almost certainly doing so from a place of love and generosity. How to (successfully!) 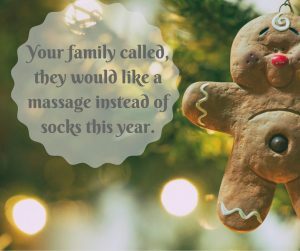 give the gift of massage. Massage is an amazing gift! But there are a few steps to think about in advance. Think about the best way to deliver your gift. Gift certificates are the easiest way to give a massage as a gift, as it allows the individual to schedule on their own. Scheduling on their behalf can sometimes work as well, although this can require additional strategic planning. Look for genuine excitement. When you mention massage are they enthusiastic about the idea? “Oh my gosh, that sounds amazing!” is what you’re looking for, not a polite “Yeah sure, I guess I would go if it were free.” If you can get a more excited response by offering new socks, go with the socks. But many people are thrilled by the idea of getting a professional massage as a gift. Talk with your massage therapist. Are they accepting new clients right now? (I am!) Do they allow people to purchase massages as a gift? (I do!) Do they offer the kind of massage this person needs or wants? For example, I offer massage and reflexology that is deeply relaxing but not painful. If you’re looking to give a massage as a gift to someone who needs a “no pain, no gain” type of massage, I’m probably not the right massage therapist for them. Plan WELL in advance if you want to make the appointment for them. Massage openings fill quickly, especially around holidays! Don’t assume that spaces will be available on a particular day just because you’ve got a month to spare. Consider and remove obstacles. Unlike a nice sweater or a juicy novel, there can be a few barriers to someone enjoying even a gifted massage. Transportation and accessibility. Will you need to help them get to their massage? Childcare and other care-giving responsibilities. Will they be more likely to accept the gift if it’s accompanied by an offer to babysit? Anxiety. Receiving a massage for the first time can be intimidating. Going together or talking about what to expect can be useful. You could also show them my “what to expect” posts about massage and reflexology. Massage should never come as a surprise. They might not like massages at all. It’s hard to imagine if you’re a fan of massage, but some people are just not comfortable with it. Imagine being invited out for your birthday and finding out on arrival that your loved one has planned for the two of you to go get your teeth cleaned together. Not fun! They might have a contraindication that you don’t know about. Taking your niece for a surprise afternoon of pampering might seem like a fun idea until she tells you she’s dealing with lice or a fresh tattoo. They might want to prepare for a massage. Some people feel more comfortable getting a massage if they’ve dealt with their personal appearance first. Others might decide to forgo a hair or makeup appointment if they knew they would be getting a massage that day. People should be given the opportunity to prepare however they see fit. They might want to plan their day around the massage. Some people feel extra tired or a bit woozy after a massage. If they plan on delivering an important speech or competing in an important athletic event shortly afterwards, they might be concerned about how it would affect their performance. They might have a preferred massage therapist. Not all massages are the same! If they already have a relationship with a massage therapist that works best for them, they might not want a massage from someone who has a completely different style. The solution to this? Talk about it in advance. It’s better to take some of the mystery out of a surprise and know that it’s welcome than to end up with the Worst Gift Ever trophy. What if they love it? This has been an awful lot of what-if-ing. What if they don’t want a massage? What if they can’t get to their massage? What if they’re just being polite, and get a massage but kind of hate it? But there’s another important possibility to consider: what if they love it? For starters, you won’t hear anything about it from me. It doesn’t matter if the recipient is your spouse, sibling, parent, or anyone else super-close to you. If they really enjoy their massage, if it eases their pain, if it helps them to relax … you can ask them all about it. The fact that it was your gift doesn’t make a difference. Once you give that gift, it belongs to them, and their experience is just as private as though it was all their own idea. Don’t forget the most important gift recipient: yourself. You can’t pour from an empty cup. Rest matters. Peace matters. Sometimes, one of the best gifts you can offer others is to take a moment away from the chaotic world, so that you can be a better spouse, parent, colleague, neighbor, or friend. Sometimes self-care can feel like a strangely radical act, but it’s a vital one. When we have good examples of people who know to care for themselves before running themselves ragged, it’s a better environment for everyone. If you’d like to give the gift of massage, please visit my website where you can purchase sessions in my online store, and then schedule conveniently 24/7! This entry was posted in Massage on November 18, 2018 by derryberrymassage.